After a nearly 15 year hiatus from the airwaves, Jay Kordich returns to TV with an infomercial for his PowerGrind Pro juice machine. 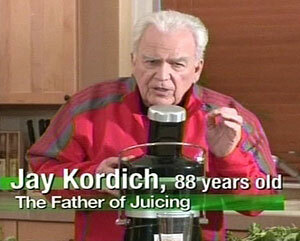 It is not clear why Kordich decided to make an comeback after so many years, but with the recent death of Jack LaLanne, Jay might have seen an opportunity to once again dominate the category of energetic old men selling juicers on infomercials. The version of the PowerGrind Pro infomercial I saw was only 5 minutes long (although a full-length version might also be airing). It includes some old footage of Kordich as well as product demos taped more recently. Good to see the leapfrogging rivalry between Jay Kordich and Jack LaLanne continues even after Jack LaLanne is dead. YEP…THAT’S ME! I am not dead, and certainly have been juicing all these years I was away. It’s my life’s work and I am grateful to be back out in the real world again. Retirement is not for me. And no, I didn’t mow down my eyebrows. I think they are just learning to relax. Hey Jay! 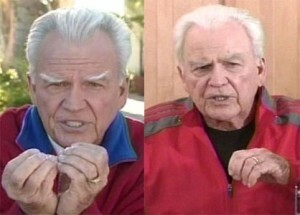 looking good after all these/those yrs. but…where’s that “orange glow” u used to have? love yer beet apple liver cleanser.